The Ramos Gin Fizz. The Sazerac. The Mint Julep. Cocktails can have some great origin stories, but how can you tell sober fact from tipsy fiction? This week, we're going cold turkey to get the details behind that noble institution of pre-dinner drinking: the cocktail party. Legend (or Wikipedia) says the first cocktail party was held by Mrs. Julius S. Walsh Jr. in 1917 St. Louis. As we'll learn, the real story is *way* more complicated, stretching from Revolutionary America to the swinging 1970s. While Mrs. Walsh may not have invented the cocktail party, her life was full up with martinis, mayhem, and, yes, even murder. Clara D.D. Bell Walsh, also known as Mrs. Julius S. Walsh Jr., (1884-1957) hosted what has often been remembered as inventing the cocktail party in St. Louis in 1917. Although the term may have been in use decades before her famous parties, she helped balk social trends which condemned women who drank publicly. Beyond her association with cocktails, Clara Bell Walsh led a very full life. Raised as one of the wealthiest women in the state of Kentucky, Clara devoted her life to her two favorite hobbies: horses and parties. First Cocktail Party? Or First Boozy Brunch? Mrs. Clara Bell Walsh's parties received quite a bit of attention from the press. Her party in the spring of 1917 is often (incorrectly) called the "first" cocktail party due to a misreading of the article describing the event. Look below and you can see that it isn't the novelty of the cocktail party itself that the reporter is commenting on, it's the unusual practice of having it on a Sunday afternoon! Given Mrs. Clara Bell Walsh's home in St. Louis, it's probable that she may have run into Tom Bullock at the St. Louis Country Club (the locale for her infamous Baby Ball in December, 1916). Tom Bullock was a famous bartender throughout the United States by the late 1910s & became the first African-American to write his own cocktail manual, The Ideal Bartender, published in 1917. Here are some choice recipes from his book that were served at Mrs. Walsh's infamous Sunday afternoon cocktail parties. "You need not fear to offend by refusing to take wine with a gentleman, even your host. If you decline gracefully, he will appreciate the delicacy which makes you refuse. If, however, you have no conscientious scruples, and are invited to take wine, bow, and merely raise the glass to your lips, then set it down again. You may thus acknowledge the courtesy, and yet avoid actually drinking the wine. No lady should drink wine at dinner. Even if her head is strong enough to bear it, she will find her cheeks, soon after the indulgence, flushed, hot, and uncomfortable; and if the room is warm, and the dinner a long one, she will probably pay the penalty of her folly, by having a headache all the evening. If offered any dish of which you do not wish to partake, decline it, but do not assign any reason. To object to the dish itself is an insult to your entertainers, and if you assert any reason for your own dislike it is ill-bred." Books like Beverages and Sandwiches for Your Husband's Friends, written by Mrs. Alexander Orr Bradley and published in 1893, gave a number of recipes for cocktails and punches (and, of course, sandwiches) aimed at the wife and homemaker. Such texts suggested that women were often in charge of making, but not drinking, alcoholic beverages in the home. An ad for Heublein's pre-made club punch from the December 9th, 1897 edition of Vogue Magazine advertised to women looking to try cocktails. The ad suggests cocktails were primarily aimed to men prior to this date. Specialty beverage books, like Daughters of the American Revolution, A Book of Beverages (1904) continued to market alcoholic drink recipes to to housewives. This book capitalized on the long tradition of mixed drinks in America, including recipes for punches, nogs, flips, and shrubs. It suggested American women had long been associated with making excellent cocktails, but not necessarily drinking them. By the 1920s and 1930s, with low public support for Prohibition in America, cocktail-drinking women were seen as rebellious activists. In 1930, Vogue Magazine described the ideal "anti-Prohibitionette", comparing them to the suffragettes of earlier decades. According to the magazine, women who fought for Prohibition's repeal were those who had "a certain freedom of mind...women who went out to fight for a vote. In the war they drove ambulances...They are athletic....[They} were the first to drink cocktails...They pile up the qualities of mind and manners that make leaders"
The Noble History of the Shrimp Cocktail: Victorian Origins of the Cocktail Party? Although cocktails or mixed drinks had been growing in popularity throughout America and Europe since the early 19th century, the custom of enjoying a mixed drink before dinner (e.g. cocktail hour) may have seen its origins in the fancy Victorian 19th century. A typical first course at a formal meal would often include cold shellfish, accompanied by a fortified wine, such as sherry or sauterne. This practice of cold shellfish paired with alcohol may have given rise to both the custom of having a drink other than wine before dinner, alongside a small snack- what would eventually give rise to the cocktail party canape. The association between the cocktail and the Victorian shellfish course may also have led to a blending of the two terms. By the early 20th century, it was common to find "oyster cocktails" or "shrimp cocktails" served at formal meals. There was even an early practice of holding "oyster cocktail parties", presumably where nothing but shellfish and strong drinks were consumed. A 1903 banquet held in San Francisco for President Theodore Roosevelt opened with the trendy first course of "Pamplemousse aux cocktails d'Huitres Frappes" (Grapefruit with Oyster Cocktails) served with Cresta Blance Sauterne. Cocktail Parties: The Fast Road to Hell? 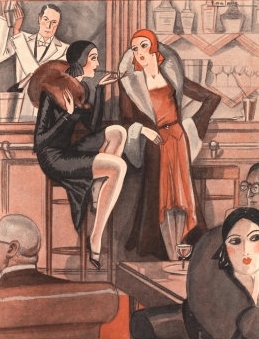 In the first decade of the 20th century, cocktail parties were often considered scandalous, immoral, or decadent. Early uses of the term by newspapers in America almost always cast them in a negative light as well as the women who either hosted or attended them. An article from the January 9th, 1913 edition of The Tacoma Times read: "Plans for the 'Woman's Committee of Fifty' are going straight ahead in spite of the emphatic chorus of 'Isn't it a shame!' and 'How perfectly horrid!' that echoes through the lounging and tea rooms of several of the most swagger (sic) women's clubs in all Gotham today. The 'Committee of Fifty' is to make efforts to put the fashionable clubs for women where there are tea parties with cocktails on the side, bridge whist for money stakes, and even more bizarre amusements out of business." 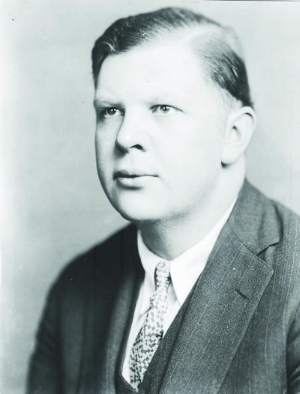 James Beard, who had moved to New York City as a hopeful actor and singer, opened up Hors d'Ouevre Incorporated in 1937 when his Broadway dreams failed to pay off. It capitalized on the surge in popularity of cocktail parties following the repeal of Prohibition in 1933. 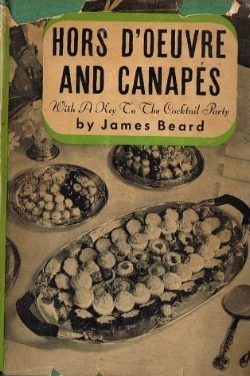 In 1940 he published his first book Hors D'Oeuvre and Canapes with a Key to the Cocktail Party, an instant classic. It made Beard a culinary icon, leading to his friendship with Julia Child, along with the numerous courses and lecture he gave on cooking for the next four decades. You can still buy the original text (with some modern edits) today. Interested in trying a few of Beard's early recipes for cocktail snacks yourself? We sampled a few of his recommended pre-dinner hors d'oeuvre while sipping on some classic cocktails. Danish Ham Rolls: Trim the excess fat from six paper-thin slices of Parma ham or Prosciutto, the delicately flavored Italian ham one may buy in almost any Italian grocery carrying smoked meats. Spread thin slices of smoked salmon over this till the ham is completely covered. Roll very tightly and cut into rolls about one inch long. Spear with a toothpick and chill before serving. This recipe will make twelve rolls. A little freshly ground black pepper will do a lot to flavor the ham. Roquefort Cheese Balls: Mix together four ounces each of Roquefort cheese & butter. Add this to one half teaspoon of dry mustard and blend well. Form into balls the size of a marble and roll them in a mixture of finely chopped parsley and chives. I suggest a mixture of two parts chives to one part parsley. Mushroom Caps Filled with Roquefort: Select twelve perfectly shaped, raw mushrooms and peel them carefully in order to keep the smooth quality of the cap. Stuff them with the Roquefort mixture given above and sprinkle the cheese with chopped chives. The raw mushroom flavor has a peculiar sympathy of flavor with the Roquefort. Heat the broth; add the curry powder & stir till dissolved or blended. Add the white wine and allow to simmer for one half to three quarters of an hour. Mix the arrowroot with a little water or broth; add it to the mixture and stir til thick. Throw in the raisins and place the sauce in a double boiler to keep warm. Prepare the fruits and place them in a refrigerator to become thoroughly chilled. Serve them on a place resting on a bed of chopped ice. By the 1970s, the origins of the cocktail party (and Clara Bell Walsh's involvement) had faded into the mists. English writer Alec Waugh (1898-1981), brother of Evelyn Waugh of Brideshead Revisited fame, even claimed in the opening line of a July 1974 Esquire magazine article that, "It is my belief and boast that I invented the London cocktail party- in April 1924". Serving daquiris between 5:30-7 (between afternoon tea and dinner), Waugh insisted he had single-handedly introduced the pre-dinner drink hour to the English as a solution to "...what to do on winter evenings between half-past five and seven." Wayne Curtis reflects on what’s lost and gained as cocktail and spirits writers—as well as curious consumers—seek out well-supported history over well-spun stories behind the bar. Vermouth, Campari, and the Americano Way: the etymology of the Americano & Negroni cocktails takes us from Visigothic rulers and Latin kings to Italian adventurers and the origin of the American dollar. Small correction: The name "Arthur Henry Savage Landor" should be "ARNOLD Henry Savage Landor". Thanks to PureZOOKS for pointing that out!